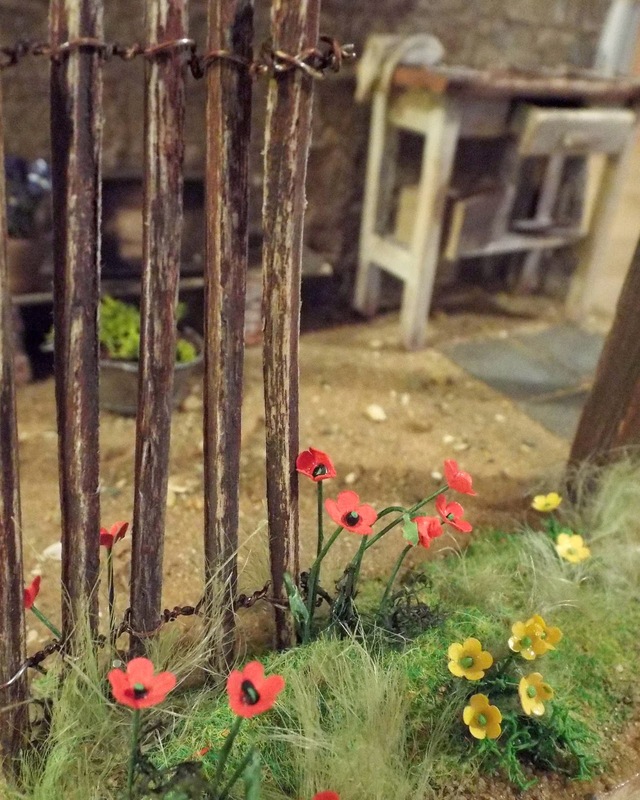 Nostalgia In Miniature Workshops: April Workshop Preparations Now In Full Swing! April Workshop Preparations Now In Full Swing! April is approaching fast now so it won't be long before our next workshop! You will probably already have seen that booking closed earlier than expected - this was simply due to the fact that all spaces were filled...."Round The Back Of The Old Gardener's Cottage" has proved a popular project! Preparations are now well ahead and kits are already being prepared. Robin has been busy emailing out invoices to everyone who has booked as the remaining balance is now due. If you are booked to come in April and have still not received your emailed invoice could you please get in touch with either of us asap? It was great to see so many of you at Thame Fair last month....hope you enjoyed the day. Not only was the prototype for April's workshop on display but so too our Seaside Scene, which was actually up for sale on the day (created for Dolls House & Miniature Scene magazine last summer). 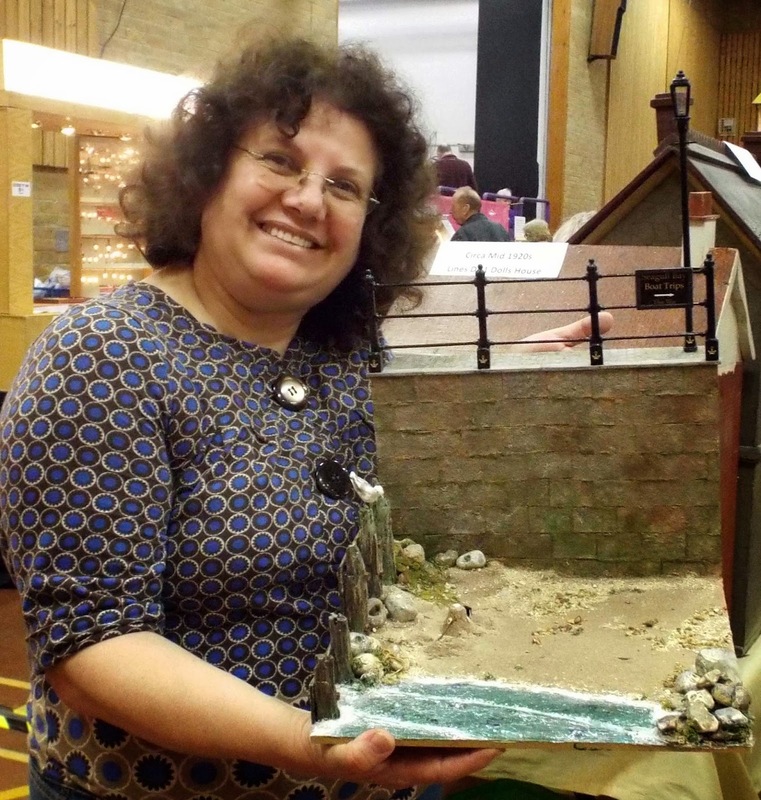 We are delighted to announce that Mrs G. Stevenson (pictured here) from Hertfordshire was the lovely lady who purchased it and she's looking forward to creating her own scene with it - 50% of the proceeds have been donated to Breast Cancer Campaign. Meanwhile, we've both been up to our eyes in frantic creativity for another huge magazine project....probably the most ambitious we've ever undertaken to date, and at last it is complete. Unfortunately we are not able to show you any pics just yet, it all has to stay under wraps for now but shortly it will be on display at Thame Museum as part of a special exhibition! At last we have added additional items to the "List Of Items To Bring" page on the website, which are relevant to this particular workshop. We must re-iterate however.... PLEASE DO NOT WORRY if you do not have some of the items on the list, we will have a few spares of most items. However, if you are having to share equipment you may have to wait a while as it is being passed around so the more items you are able to bring, the better. The workshop will begin at 10.30am and end at 4.30pm, and is taking place in the Conference Room situated within the restaurant area of Bicester Avenue Garden Centre. We shall take an hour's break at lunchtime and it is entirely up to you whether you bring your own sandwiches or have a bite to eat in the restaurant. The restaurant serves hot and cold food. There is ample free parking and lots of shopping opportunities within the complex as you will find stores such as Hobbycraft, Lakeland, Laura Ashley, etc. Then of course, there is the garden centre itself which sells a lot more than just plants! It should be a brilliant day.